The guy who originally wrote the software for John Madden Football hasn't been paid in decades even though the game still uses his code. In 1986, there wasn't a lot of processing power available on home computers but somehow Robin Antonick was able to use knowledge from ex-Oakland Raiders coach John Madden to write a game that featured 11 players to a team. Antonick said he worked in a cubicle a few doors down from Electronic Arts founder Trip Hawkins creating John Madden Football for the Commodore 64 and other PCs to release in 1988. The football series came out on the Sega Genesis console in 1990, still based on Antonick's code, and went on to make over $4 billion in sales with annual releases over the next two decades. Antonick believed that after 1992 - when he received his last royalty check from EA - the game was completely redesigned but then he saw marketing copy celebrating the game's anniversary which stated that the current Madden NFL 11 is still derived from his work. Antonick has filed a suit in the state of California for years of unpaid royalties and "disgorgement of all profits" - that $4 billion. 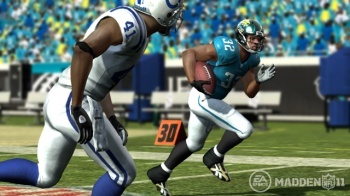 "Only recently, as a result of publicity surrounding the 20th Anniversary of the Madden videogame did Antonick become aware that Electronic Arts did not independently develop subsequent versions of its Madden NFL software," the complaint reads. "Instead, according to recent statements by Electronic Arts founder Trip Hawkins, the current generation of software apparently derived from software developed by Antonick." According to Antonick, the development deal he signed with EA back in 1986 entitles him to royalties from all derivative works of his code. The claim also states that EA licensed Madden for use on consoles without Antonick's permission. "Electronic Arts decided that it did not want to share profits with [Antonick] even though he was responsible for the development of virtually all of the ground-breaking technology at the heart of the game." To think that someone who was so instrumental in creating the backbone of a terribly successful franchise not being properly compensated is quite disgusting. Artists, even videogame programmers, deserve to reap the benefits of their work. On the other hand, while Antonick may have a claim that a nugget of his code is still present in Madden NFL 11, it's not like he was the guy who has been updating the programming for 7th generation consoles or implementing new features. I don't think he deserves all of the $4 billion profits, but he should definitely receive a fair shake.